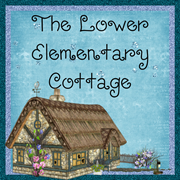 The Lower Elementary Cottage: Autism Leaps and Bounds! Yesterday I told you about how I like to push my kids to their limits at the end of the year. Yesterday there were moments where I was literally tugging on my hair with frustration when one of the kids just didn't get it during math. He was in his own universe and just couldn't understand what I was saying, no matter how hard I tried. This morning was a whole new world! It's one of those days that make those pull-out-your-hair days worth it! This morning my "classic autism" kid was like a whole new kid from the second he stepped in the door! It's one of those days that made me take a step back from where I started with him. Take a peek into my world with him and see how far we've come along this year. I thought this was a perfect Autism Awareness Month post! Graphic by the 3AM Teacher! The first week of school I had tantrums EVERY SINGLE MORNING! In fact, it may have been longer than a week...maybe a month. I choose to block that out...Anyway, this was an ongoing routine of yelling and crying every morning for 20 min. to 1 hour. Then he'd get over it, and we'd move on with our day. When he spoke it sounded like gibberish. They were all real words, but the word order was a mess and every sentence was a question, not a statement. Example: "Do I want to go home?" instead of "I want to go home!" or "I have to go bathroom?" instead of "I need to go to the bathroom." His voice was also very strange and unnatural sounding. His voice constantly went up and down without a logical reason, his pausing was irregular, and he had very clear echolalia (repeating heard phrases). This all happened during both speaking and reading aloud. He had no ability to answer who/what/when/where/why questions and had fast reading with little to no comprehension. He couldn't do more that a minute of work without a prompt to focus on his task. Literally one minute was A LOT! He did not interact with peers...ever. He walked in to class as I was at the sink washing my hands and said, "Hey Lisa, are you in here?" and when I popped my head around the corner he said, "Oh there you are! Good Morning! I'm going to fix the spelling on my editing page, but first I'm going to go out and play on the playground until the bell rings." I smiled and told him I'd see him in a bit. That was the longest morning talk we've ever had! Well, longest with him talking at least! And his voice was completely normal! During reading he read a story with PERFECT voice, tone, pausing and even did the correct sounds in a book filled with onomatopoeia. Then we talked about the author's purpose. He looked at me like I was nuts at first, then he was able to select the purpose from a list perfectly every time after just one example. For the ENTIRE DAY he stayed focused on his work without prompting. In PE on Monday he got in trouble for stimming instead of doing the activity after a million prompts to focus. Today he did the WHOLE PE class without prompting! There is a kid who generally irks him (for good reason) and today at the end of story time my little guy intentionally tried to hold this kid's hand to walk back to their seats together. He would NEVER have let the other kids touch him before! We had several people in my class today for various reasons. He greeted every single one of them spontaneously! He even asked them logical questions like "Are you going to OT? Is that like speech or is that like a doctor?" And waited for a response and responded appropriately. Oh happiness!! But then it just got better! He hates math. Positively detests math time and always needs prompting to get back to work. Today he was the first one finished and he got it all right!! He's never been the first kid done! Since he struggled so much during math the last couple of days I bribed him a little to do some extra math with me because he was done early. I told him if he did 5 more measuring activities with the meter stick, he would get a piece of chocolate. He couldn't understand measurement beyond an inch ruler yesterday. He had zero concept of how to hold the spot with his finger and measure longer than one foot/meter (depending on the unit we were using). When we got to measuring object #5 today, he just about had it. So I convinced him to measure one more thing all by himself and earn and extra piece of chocolate. 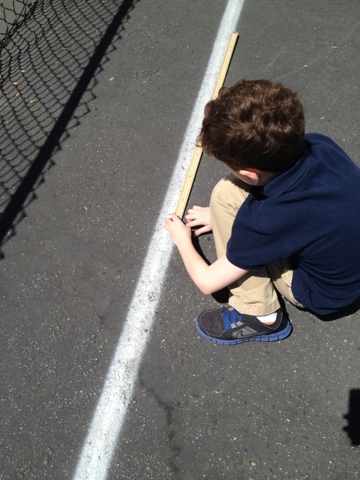 He did it PERFECTLY and measured a 5 meter line outside all by himself!! He was careful about marking the ground with his finger where the meter stick ended before moving it to measure the next meter. Yesterday he was telling me the front door was 33 meters tall and today he's measuring correctly after just 5-10 extra minutes of practice alone with me. Then at the end of the day he randomly went and started a conversation with a classmate this afternoon. It was a boring conversation, but he did it! Whoo hoo!! I just might be the proudest teacher in the world right now! 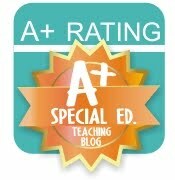 It's days like this that make me love teaching kids with autism! There is soooo much in their little heads, I just have to dig a little harder to get it out. But when they decide to blossom, their growth can be HUGE! I've achieved more with him in the last 8 months than I ever thought possible! Have you ever taught a child with autism? That is awesome!!!! So inspiring!!! What do you think helped most with the language aspect? You rock, Lisa! Another big help was books!! I read to/with him a lot and made a big deal about the difference between when I read a story and the way he reads it. I even read like him for him to understand how weird it sounds. Then he started reading like me and it transferred to his conversational voice too. I swear this could be a whole other post... haha! What a neat story!!! These are definitely the things that make teaching so meaningful!! Thank you for the shout out!! I love that you are making a difference in the lives of so many!! !